Remixing a song is an entirely different art than making an original song from scratch. At times, it can turn out to be easier than making an original, but if you don’t know where to start, it can become a time consuming and tedious job. This is because there are endless ways to approach a remix, and you could easily find yourself overwhelmed, or struggling to get started. There’s always the pressure of having to live up to the quality of original and not knowing whether your interpretation will be appreciated by critics. But you shouldn’t focus on these doubts and thoughts at the beginning, as making an original track can also result in the same fears. At the end of the day, you’re still making art! The difference is that this time you’re not starting from a blanc canvas. Why Should You Make A Remix? You might wonder why you shouldn’t just focus on original tracks, instead of entering a remix contest for a track and competing with hundreds of producers or accepting to remix another producer’s track for their official remix EP. First of all, you get access to professional material to work with and it’s a great chance to study how these experienced producers put together their tracks. But most importantly, if you win a contest for an important artist, it can kickstart your career by boosting your reputation, leading to your first releases with labels, and opening new doors. Many times, the winning remix of a contest gets published on an official remix EP, wins cool merchandise, gains exposure on Soundcloud, and a chance to be promoted by the artist and label. Even a unique bootleg remix can take your career to the next level! Luca Lush built up his reputation with unique bootlegs and remixes of famous tracks on Soundcloud. Some of them have millions of plays! So don’t underestimate the power of creating popping remixes! But how exactly do you set yourself apart when making a remix? Luckily, we’ve put together a list of ten essential tips to get you started and set you up to make a killer remix! Most of the time, a good remix starts with having quality source material and stems to manipulate. The better the audio quality of the tracks you’re working with, the best possible and professional sounding outcome you can get. If you’re not familiar with the term stems, they are essentially subgroups of the track, split by type of instrument. For example, for a contest you would get the stems for the Drums, Bass, Vocals, Melodies, Synths, and FX. Sometimes you might even get more; it depends on how the producer has decided to group their tracks together. As you become a more seasoned producer, you will be contacted by labels to remix tracks or exchange stems directly with other producers. But how do you find quality opportunities at the beginning of your career to build experience? Don’t forget to also keep an eye out for remix competitions from your favorite artists! Chances are that if they host one, they’ll be posting it all over their social media pages. This is an exciting way to remix the producers you look up to and also take a look at one of their tracks decomposed. Regarding the stems, make sure to ask for them in the highest quality possible. A good rule of thumb is to ask for 24bit Wav files with no normalization, clipping, or processing chain on the master bus. Once you have the stems, it’s time to do some digging around for the BPM and key of the track. Sometimes, remix contests will give you both pieces information, but there will be cases where you won’t have any of that start off with. While it’s not necessary to know the key of the track, it does help you to work faster when picking which samples to use or when creating melodies and chord progressions. However, you must keep in mind that writing melodies and progressions that are accidentally out of key can ruin your whole song. Especially at the beginning of your career when you may not have enough experience to recognize whether you’re writing in key or not. So we definitely recommend following these next tips to discover they key of the original. The first step to take care of is to check if the original track is on Beatport, where they always list the key and tempo of the track. If the original doesn’t belong to any subgenre of electronic music, it might not be listed on beatport. In that case, there are still a few tricks you may use to discover this info. The first is to Google the name and artist of the track, plus the words “BPM and key” next to it. Chances are, some other website has those listed so it’s worth a shot. Last but not least, there’s a more practical approach that might require a bit more effort. Start off with importing the stems into your DAW. To find the BPM, lineup the beginning of the track exactly on the down beat, activate the metronome, and start changing the tempo within the software until it matches the one of the track. If you’re in Ableton, make sure the track is not warped already, so it doesn’t follow the tempo change within the software. This method relies heavily on your ears, but with a bit of practice, you will be able to find it fairly quickly. Finding the key requires a few more steps. Make sure to pick one of the tracks with more distinct melodic content - typically where there are chords, melodies, or a clear sub-bass - and slap a tuner on the track. As you’re playing back the track, the tuner will pick up different notes. Make sure to write these down; the more the better! Once you have a good amount of information, you can go to ShowScale, select all the notes your tuner detected, and the software will give options for which scale your track could be in! If the tuner doesn’t give you clear results, you may also use spectrum analyzers, which can detect notes that are being played. The standard Ableton EQ Eight has this featured when expanded, but another free tool to use is the MAnalyzer by Melda Production. 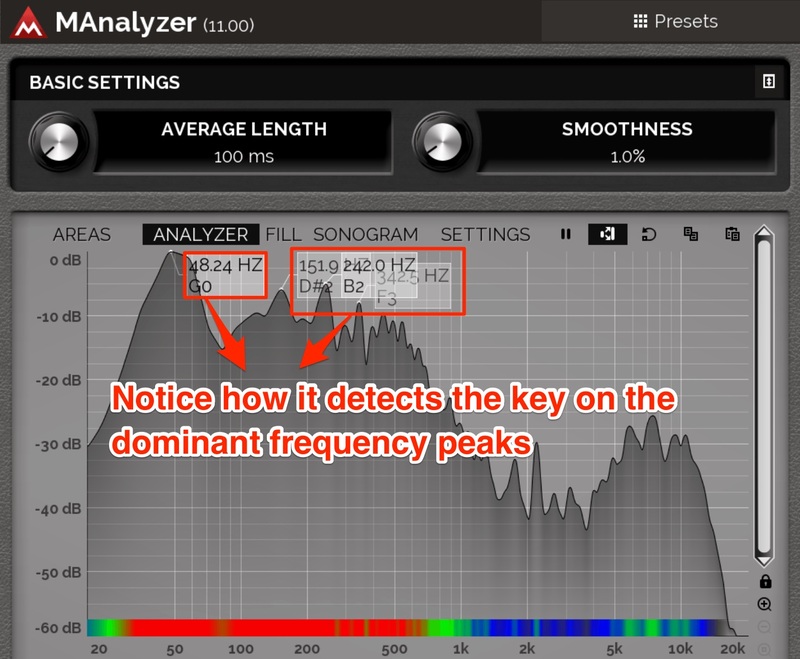 This plugin has a super in-depth analyzer which detects the note of specific frequency peaks. Once you have this main information down, you can begin with the fun stuff and get your creative process going! Chances are that if you chose a certain track to remix, you liked it from the moment you heard it or some element sparked your interest and imagination. Sometimes, it may be the vocals that draw you in, or it could be the drum pattern or melody. Either way, take that initial inspiration and roll with it. Sit down with a notepad and write down any ideas you get the first time you listen to it. For example, if you think the intro lacks energy, you could start off with a cool drum beat to steal the listener’s attention right away. 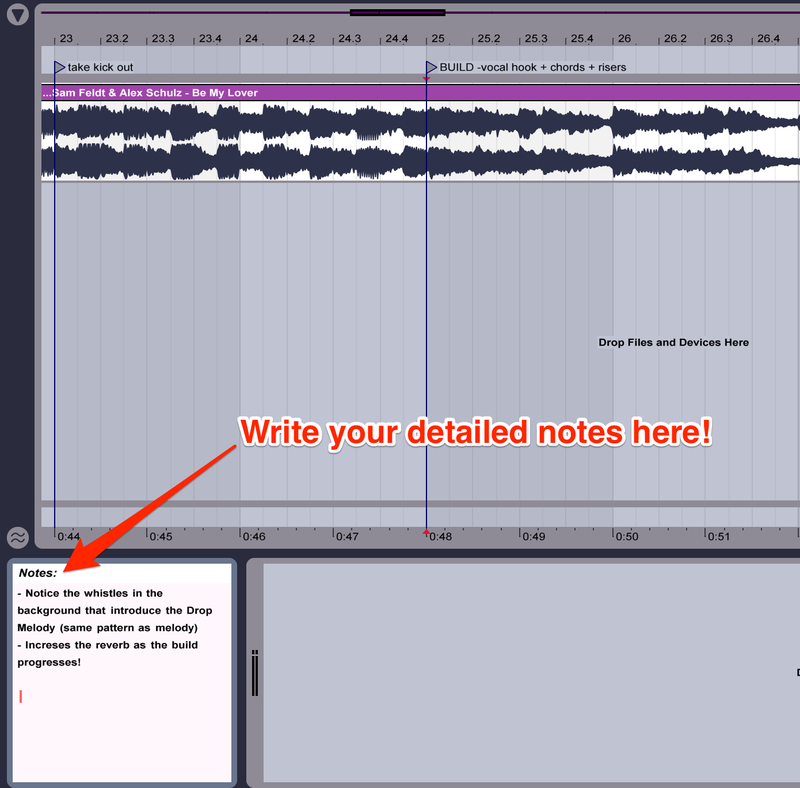 Or, as you’re listening to the breakdown, you notice that there’s space for a melody - write it down! All these ideas will come in handy later. However, don’t spend too much time listening back to the track or over analyzing each STEM. Only listen a couple of times while taking notes. Then, once you have imported them into your DAW, you should follow a few basic steps so you don’t get lost in the endless ways you could approach this remix. First, listen for any element that sparks your interest and cut them out. It can be certain percussion sounds, synth stabs, and weird effects. Just keep the ones that you would use in one of your tracks and are unique to you. Everything else you may delete. You can always import them back if you change your mind! If it’s only the vocal that you want to keep because the rest of your track is not really your style, do that! Don’t be afraid to treat it as a brand new track and build around the original vocal! A quick side note, be careful when you’re remixing a song for a contest since most of these have rules and guidelines. You don’t want to be ruled out because you only used one stem instead of their required minimum! Sometimes, certain contests require the remixers to submit their version in a specific BPM. So just be careful about that and read the Rules & FAQ’s! It can be tempting to try and make a remix in a style that’s popular at the moment, thinking your chances of winning will rise. 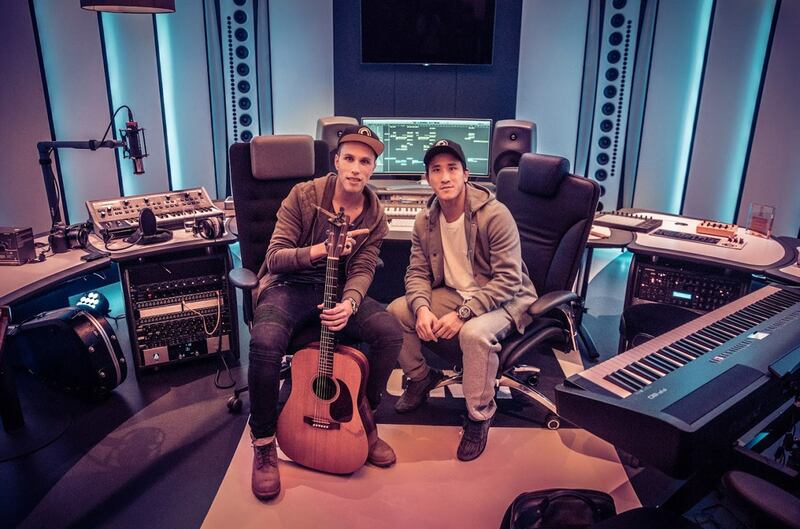 However, a remix is all about adding your personal touch to an already established track. You want to give the listeners a taste of what you’re about, so if they like the remix, they will be curious to hear more of your music! Furthermore, don’t spend hours listening to the other submissions and worrying about what other producers are doing. Focus on your craft and get smart! For example, you know you make killer Drum & Bass tracks, and the track you’re remixing is a Future Bass hit with beautiful vocals and huge synths. Don’t try to turn this into a future house remix if you don’t have any experience in the genre. Instead, you could speed up the track a little, and create an uplifting Drum & Bass liquid remix using your signature drums, grooves, and melodic lead lines! By tackling the remix this way, you will be able to work faster, more efficiently, and most importantly: without pretending to be anyone else but you. At the end of it, your fans should be able to tell that you put your hands on that track. The way to truly add a personal touch to another artist’s track is to use your signature sounds and elements. This is where all those years of saving your own presets, samples, and chains will come in handy. If you haven’t started to do so, we recommend creating your own personal Sample Pack with sounds you created and use often or were part of other tunes you made. Using sounds that you know will sound good and that you can change later on in your track, will speed up your production process when starting new tracks. So don’t be afraid to reuse these sounds! You don’t have to use a lot of them; it can be as simple as using your signature snare, transition effects, or your favorite synth presets for huge detuned chords. Your fans will be able to recognize those subtle details while you simultaneously experiment with new elements in other parts of the track. This is also a good time to show off your skills! If you play an instrument, why not record a sick guitar solo over the second drop of the track? Or, if you’re a talented pianist, try switching up the original chord progression with more intricate variations and inversions. As we mentioned earlier in tip #3, it’s good to put your ideas down as soon as possible. This also applies to the project file - especially the arrangement. As you’re gathering ideas, place markers on your project to mark each section (intro, breakdown, build, drop, etc) and indicate where you will apply the ideas you wrote down. To do this in Ableton for example, after you have inserted a locator on the project, just right click on it and select “Edit Info Text.” A blank box will then appear in the lower left corner where all our notes and ideas will be stored for future reference. In these boxes, you’re able to throw in all your ideas on which drums you want to use, types of sounds and elements to include, or even mixing techniques. If you think about it, throw it in. You’ll never know if you’re going to forget it down the road. Bear in mind though, that while having a good arrangement is essential to the track, you don’t have to lose your mind over it. It’s okay to use the same one as the original, no one will take points away from you for that, what matters is the content of the track. If you have a creative way to switch it up, that’s great. But if you don’t have any ideas on an alternate arrangement, stick with the original. This way you’ll be able to focus on other creative parts of the remix. Whenever you begin working on a new track or a remix, you feel that self-induced pressure that you must create your best track yet - something the world has never heard before. While this is a great long-term goal, to develop your own sound and be unique, it must not drive you insane and interfere with the creative process of the track you’re currently working on. Remember that with every track you finish, you have made progress and probably learned something new while doing it! Whether it’s perfecting a certain sound you were trying to achieve or improving your mixdown, it’s all part of the process of becoming the best version of you. Amongst all the remixes on the EP, this is not the most radical reinterpretation. The melody is left untouched and the vocals are also in the same key, but the drop features a new drum pattern with heavy 808’s. Taska Black’s signature melodic leads and synth sounds are also included. He kept the arrangement pretty similar to the original, but the result is an energetic remix that works great in a club setting as an alternative to the original. On the other hand, take a listen to BeauDamian’s version of the track. The Dutch producer completely switched it up. He came up with a new drop melody and pretty much built a new track around the original vocals. Both remixes received great traction despite the differences, which should help you understand that there’s no set formula to remix a track! Whether you decide to completely flip the original, or just to add some variations to the drop, you want to aim for some kind of creative content to make your remix standout. The judges will listen to hundreds of submissions of the same track, so what they’re looking for is something that will stick out to their ears and catch their interest. That’s usually achieved by having unique sounds or an unexpected twist. Try and do some research on what kind of remixes have been done for that producer in the past, and study which kind of elements are present. That’s usually a sign of what that artist likes and might be attracted to in a future remix. We even asked one of the most exciting new talents in bass music, Rohaan, to share some cool techniques he uses when remixing tracks. His remix for VALENTINE & 4AM - Us (feat. Naji) [Rohaan & Laxcity Remix] is a unique example on how to get creative with a track and take the vibe into a new direction. The way you present the track is just as important as the content. You might have created the most unique and original remix on earth, but if it’s not mixed and mastered well, the judges will automatically trash it. Artists want to work with counterparts who have experience and know how to put together a record from beginning to end. If the remix is for a label, most of them will master it for you to keep consistency across the remix EP if you win, but you still must deliver a polished mixdown ready in their hands. If it’s not for a label, you will have to take care of the mastering yourself. If you’re not confident in your mixing and mastering abilities, but believe your remix has a solid shot at being selected, we recommend getting your track mixed and mastered by a professional. You may even try asking other producer friends who have more experience to help you out. On top of this, to achieve a quality mix, you must keep it clean. It doesn’t matter if you have 25 tracks or 150 tracks in your projects, the judges will listen to how clean your overall mix is. To help you in achieving this, make sure to pick quality sounds and samples to begin with and give each sound their own space to breathe and shine. This implies not stacking too many clashing sounds on top of each other, but rather having each sound serve a purpose. Use EQ’s and effects wisely to take out unwanted frequencies that can clutter your mix and take sounds out that don’t really add value to your track. A good way to test this is to compare a section of the track with and without a particular sound. If you’re having trouble hearing it clearly or it doesn’t really benefit the song, take it out. It will only make your mix cleaner and free up space for other sounds. If you’re part of a contest or have a specific deadline, you don’t have to be the first one to submit your remix. Finishing it quickly will not give you any extra points. Nobody will care whether you submit it three hours into the contest or if you’re the last one to. The judges will only care about how good your track is. But what can you do if you actually wrapped it up within the first week? Why not try making alternate versions and then choose the best one at the end. Some competitions even allow more than one entry; so if you have two or three solid remixes, enter them all to increase your chances. Just make sure to read the rules first. You should also start gathering feedback from other producers and make tweaks as you go. Stick to a group of trusted producers who you know will share objective and professional feedback. You may also ask your friends for general feedback. See if they like the track and whether they would listen to it for even more constructive criticism. However, in this specific case, you need to take their feedback with a grain of salt. Since they can’t comment on any of the technical aspects, they will just base their opinion on their music taste and subjective preferences. Some of them might not even be into electronic music, so don’t get discouraged if they have some negative comments on your remix. Just don’t feel rushed to submit it, use all the time at your disposal to your advantage. While the art of remixing is an open book, we just gave you a good set of tools and tips to get you started on the right foot! This is a good list to keep on your desk when working on your next remix. If you reference these tips, you’ll learn to work more methodically with a basic structure - which will help you work faster and more efficiently. 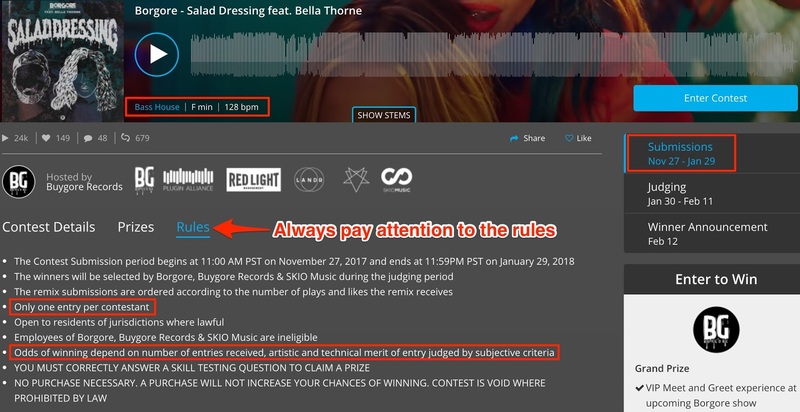 And if you ever decide to join and create a remix for a contest, make sure you check out this 13 essential tips to impress the judges! This is it, let us know in the comments any of your favorite techniques you use while remixing songs!